Gila Manolson’s New Book – Must Read!!! Does everyone here remember the refreshingly honest interview that I posted with Gila Manolson last year?? If you haven’t read it, read it NOW – I often reread it when I want to be inspired!! There are many aspects of Judaism that everyone finds intriguing – but nothing quite as much as the concept of shomer negiah (guarding one’s touch). I only made a few short videos about the subject, and it is the one that is most asked about. I can’t begin to tell you how many people from other religions have written telling me how this idea has changed their relationships and made their lives so much better!! Gila Manolson has written THE book on shomer negiah (it’s called The Magic Touch), and in her interview she told us that she is working on a new version specifically to benefit the lives of christians. Well… it’s out!! So all of you who are christian (or even secular or any other religion) that want to learn about this life changing idea… this is for you! Andrea tells me that a lot of you are Christians who are intrigued by the Jewish practice of hair-covering. (Aren’t Andrea’s hair-coverings unbelievably stunning?!?) 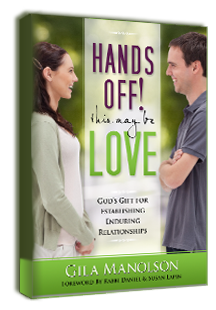 And I hear that some of you are intrigued by other Jewish practices as well, including being shomer negiah, refraining from getting physical in premarital relationships–what I call “cherishing touch.” Well, I just came out with a book you’ll find interesting–it’s called Hands Off! This May Be Love: God’s Gift for Establishing Enduring Relationships, that offers a practical, down-to-earth explanation for the power of this practice, backed up by sources from ancient Jewish wisdom. You can learn more about it and order it on my site, www.gilamanolson.com. Please check it out! This woman was one of my biggest influences when embarking on my journey towards a more meaningful life… and she still is one of my biggest inspirations! I am so happy that she came out with this book for all of you!!! Finances are tight, but I would love to read this… does it apply only to singles or is it written in a way that shows how it impacts marriages as well? I loved her books when I was younger and they helped me and my friends a lot to understand the importance of the shomer negiah. Thanks for blogging, love it all.